Now there’s a lot of really impressing and advanced medical illustrations available to students of anatomy and medicine today. But nothing appeals to me like the simple and effective lithographs that accompanied the early editions of the tome of anatomical knowledge that is Gray’s Anatomy. The 1918 edition is in the public domain, and is available in its entirety online. All illustrations here, relating to the submitted posts, are taken from this edition. So once again I present you with a very visual edition. Hope you enjoy it! Dissection of the lower half of the mamma during the period of lactation. Click to enlarge. Buckeye Surgeon is concerned about the overuse of MRI in breast cancer, and a recent UK multicenter trial seems to support his notion. Moving into the abdomen, Buckeye also treats us to a rare finding of portal venous gas in a patient with an infarcted cecum. 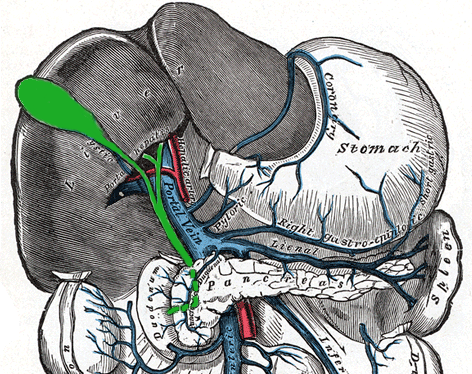 The gall bladder (section of "The portal vein and its tributaries"). Click to enlarge. Dr. Piltz with the Ant Ears found his mind working in mysterious ways during the early ours of a night call. Though I can understand that the implications of a previous surgery can slip your mind, its strange when it slips everybody’s minds. bongi over at other things amanzi, doesn’t know when to shut up, making even the sternest professors laugh with a perfectly timed remark at the expense of an internist. One thing he does know, however, is to stay awake during surgery. Many don’t, but few have perfected it into an art form like this assistant. Martin, who blogs about his life with ulcerative colitis, shares a post on a talk with his surgeon before getting a colostomy last week. 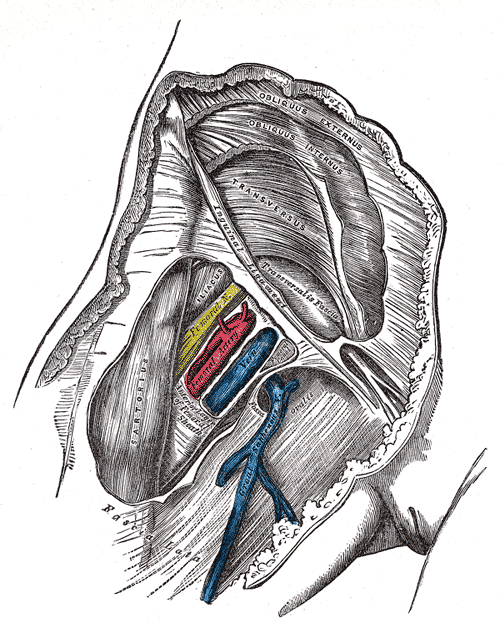 Diagrammatic transverse section of the medulla spinalis and its membranes. Click to enlarge. Anesthesioboist T. loves the elegance of the epidural and explains what sets it apart from spinal anesthesia in an informative and fascinating post. Anatomical knowledge is paramount to the work of anesthesiologists, and recognizing this T. wrote a poem in honor of her cadaver from anatomy class. Elegant. Femoral sheath laid open to show its three compartments. Click to enlarge. Alice at Cut On The Dotted Line has a flashback to a vascular surgical case as she reads up on pseudoaneurysms in Cameron’s Current Surgical Therapy. Scrubbing in on what seemed to be a simple repair of a leaking femoral patch angioplasty, she learned the hard way exactly what the textbook emphasizes; the importance of both proximal and distal control of blood vessels before manipulation. Staying in the femoral area, make mine trauma at IntraopOrate, recounts two days of back-to-back ortho cases that left her stomped, beat up and whooped (Day 1/Day 2), including several femoral shafts, a few total knees and a revisional total hip. Mixing bone cement for the last case, she utters the immortal words: “There’s nothin’ better than the smell of polymethylmetacrylate in the morning!”. Vessels of the uterus and its appendages, rear view. Click to enlarge. Dr. P presents the fascinating story of the invention of the Sims speculum at The Blog that Ate Manhattan. The inventor Dr. J. Marion Sims was surrounded by controversy as he conducted repeated surgeries on African slaves with vesicovaginal fistulae in an attempt to find a procedure that would cure them. He ultimately succeeded, but was it experimentation or just desparation? 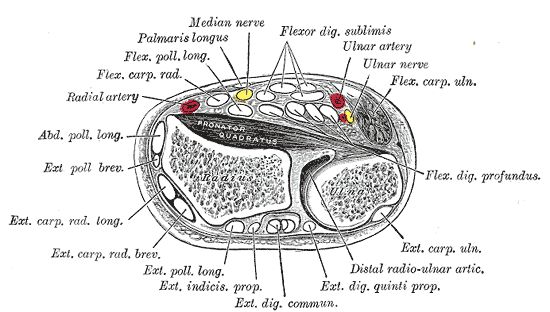 Transverse section across distal ends of radius and ulna. Click to enlarge. Horizontal section of the eyeball. Click to enlarge. March 12th was World Glaucoma Day, and ophthalmologist Joey MD wrote about the disease, the nature of which, he says, is little understood by the general public. A fun fact: In Norway, glaucoma is commonly known as “grønn stær”, which translates directly as “green starling”, while a cataract is known as “grey starling” (“grå stær”). Most people think this is related to the starling bird, but the word “stær” is in fact derived from the German word “starren” which means “staring”. A correct English translation would thus be “green stare” and “grey stare”. Not hard to tell why they were named like that, but it makes no sense novadays, as the word “stær” is only used for the bird. After all this surgery, it’s good to have Nancy Miller present us with 4 Tips for A Successful Rehab, and Vanessa Ruiz at Street Anatomy treat us to some sweet skulls. You might also like to end your weekend with a real life suspense story from the daring Anatomy Detective. That concludes this edition. The next SurgeXperiences will be up on March 29th. No host has been found yet, but you can start submitting your blog posts now via the carnival submission form, and check out all the previous editions. If you would like to host an edition, don’t hesitate to contact SurgeXperiences founder Jeffrey Leow. Oystein, this is fantastic! Thanks so much for including me in this great edition of SurgeXperiences. You’re a class act! Wow – I had no idea this wonderful stuff was now in the public domain! Thanks for sharing these great illustrations, and for hosting a wonderful edition of Surgexperiences. You are currently reading SurgeXperiences 219 at The Sterile Eye.